With the possible exception of Arctic areas, there are varieties of wild edible “leafy greens” on every continent. Man has sought these wild crops for millennia, collecting them from the land wherever they could be found. 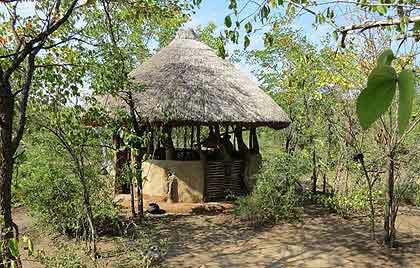 Africans are no different; just as it was done in Europe and the Americas, it was done here. But, as elsewhere in the world, wild greens and the whole concept of foraging has fallen by the wayside though rural people still do gather free food in places. And favorite food, along with half-remembered smells, trigger all sorts of emotional, nostalgic responses. to study. I love food! Well most food…almost all food, any food? What don’t I love? Shhhh…we’ll talk about that another time… You think I have a point here? 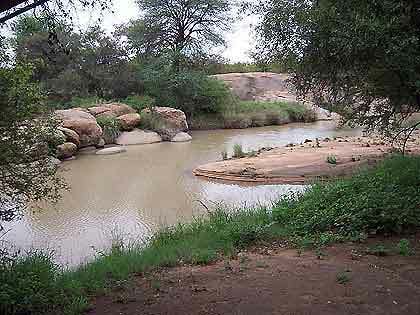 So (as a younger me recollects), long ago there was a lunch, on a farm in the bush; outdoors, beneath the acacia tree, cool sand under bare legs, faded cotton shorts, warm sunshine on naked feet. Little hands squishing handfuls of maize meal Pap (mielie pap – stiff porridge) into pint-sized rolls and dipping these in a bowl of marog based shishebo. 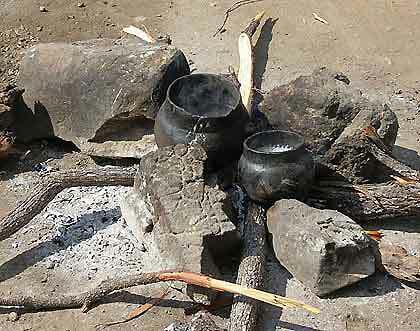 Marog in Traditional African Cooking Pots, Made From Black Clay. Shishebo is a type of stew (it can contain vegetables, sometimes chicken or meat); I remember a thick gravy-like mix of vegetables, usually marog, always onions and fresh tomatoes, sometimes with potatoes added, smoky, spicy and completely mouth-watering. Comfort food like no other; this deprived townie had never tasted anything like it before, coming as I did, from city deficiencies to farm-life riches. 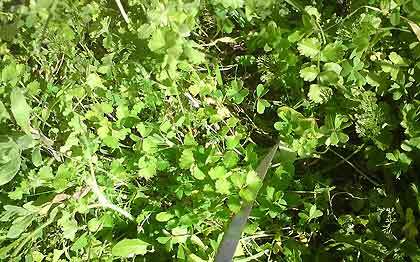 Imifino and Morogo are just two of the names for the many varieties of wild greens found here in South Africa. The North Sotho lady who introduced me to this spicy stew, referred to the main ingredient as *morog* as it is commonly known. Wild morog is a good source of minerals and nutrients and provides some trace elements. Swiss chard works well if you are not in Africa, as do many types of Asian greens, but the best substitutes I have found is a mix of wild rocket and Swiss chard. Wild rocket grows rampantly, here in our patch of sand, along with Swiss chard, parsley, summer savoury, thyme, shallots, spring onions and Jerusalem artichokes…and always mint. My later experiments in recreating these flavors had mixed results. Eventually I got to a sort of culinary compromise, good but not quite right. As far as my taste buds were concerned though, it satisfied the cravings for marog. Serve this with spicy, grilled chicken or fish, sausages, or BBQ meats and fresh, crusty bread to mop up the yummy juices. Sauté the onions in the olive oil over medium heat until they just start to brown. Add the salt and pepper. Reduce the heat and let the onion caramelize over medium-low heat for about 15 minutes, until it is browned and sweet. Increase the heat to medium and add garlic and the marog (greens), tossing until they are just wilted. 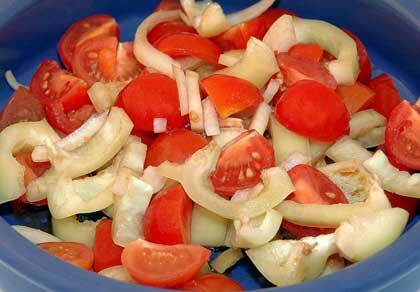 Add the fresh, peeled tomatoes cut into quarters, cover tightly with a lid and reduce heat to very low. Allow to gently braise until the tomatoes are soft and mushy (very posh cooking term meaning squishy). Break the tomatoes up with a fork or wooden spoon and mix everything together. With the heat still on low, adjust the seasoning adding sugar, salt and pepper to taste, as needed. Depending on how acidic your tomatoes, you may want to add some lemon juice or balsamic vinegar (plain white vinegar is more authentic). The idea here is a sort of sweet ‘n sour tomato-ey flavour. Should your marog “stew” look too dry, you can add a little water or stock, just enough to stop the mixture from catching. Stir well; replace the lid and leave to simmer for another few minutes for the full flavors to develop. Enjoy and take delight in your food… Nitokhazile nkujabulele ukudla as the Zulu people say.